Rae Earl shares the intimate feelings of being a teen in 1989. This memoir is told in journal format which starts on January 24, 1989 and ends right before 1990. Rae has just been released from a psychiatric ward after suffering a 'nervous breakdown'. Rae's depression is based on her loneliness and longing for a boyfriend. One thing stands in her way though--she's overweight. She finds some solace at the local pub with some boys and a few girls but behind the smiles and laughs, she dies inside every time her weight is the center of jokes. Her so-called friend Bethany ends up betraying her secrets in the worse way. Yet Rae's lack of confidence finds her back with her. What worked: The whole idea of reading someone's diary feels a tad bit voyeuristic yet I couldn't put this memoir down. The pain Rae feels of being rejected or only seen as that 'funny fat friend' is shown in her journal. Only there does she feel safe enough to take off her happy mask and tell the 'truth'. Rae's wit and humor are throughout while deep down readers glimpse the real reasons behind Rae's depression. More than a few times, my heart broke for her. It's those emotions that are sure to resonate with teens today. Rae's wit carries through some otherwise sad scenes like when a boy she's crushing on tells her he only thinks of her as a big sister. Or when she confides in Bethany that she really likes this one boy and later her friend announces that she's going out with him. I think when Rae writes that the reason the guys feel comfortable with her and that's it's okay for their girlfriends to hang with her, is equally painful and tragic. That's the heart of this memoir. How well Rae is able to shown readers the pain she carries. She mentions how she wished she could be like Olivia Newton-John's character in Grease and have someone redo her so everyone would want her. 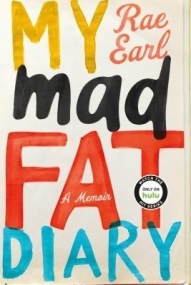 I was thinking this memoir reminded me more of Hairspray and how the 'fat' protagonist longs for just that. Only Rae's story is real without the 'happily ever-after ending'. Kuddos for Rae for being courageous to share her story with us. What I did have issues with though was the British slang and pop culture references of 1989. I was a young adult at this time so I remember much of the historical references like when the Berlin Wall came down to the fear of being nuked by Russia. But some of the other references I didn't get and that took me out of an otherwise engaging tale. To be fair though, there is a reference in the front of the book that does go over some British terms. Witty, heart-breaking memoir of a teen in 1989 who smiley veneer is cracked to reveal a girl who longs to be loved. The emotions are sure to resonate with teens today.